Based upon the most recent data analysis (December 2012) from the HRSA, in the United States there were approximately 74.5 primary care physicians for every 100,000 residents. In HRSA studies primary care physicians include non-federal doctors and osteopaths who are not hospital residents and whose principal activity is defined as patient care. Moreover, these doctors and osteopaths have a declared practice specialty as a General Practitioner or in General Family Medicine, General Internal Medicine or General Pediatrics. A more detailed examination of the underlying numbers available from the HRSA reveal Mississippi as having the fewest primary care physicians per capita of any State. 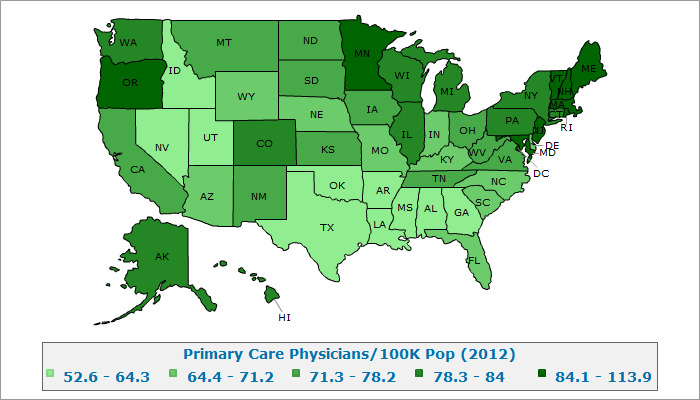 Texas and Georgia, despite being two of the ten largest population states, were among the among the Ten States with the Fewest Primary Care Physicians. Although both states have sizable raw physician numbers, the number of primary care physicians in each state is small relative to the overall population base.